iPads and other mobile devices are everywhere and are constantly altering and affecting every part of our lives including education. They are transforming the traditional classroom model where the teacher teaches and students listen to a more interactive, engaging, and collaborative learning environment. Using technology in the classroom like iPads just makes sense in this world full of tech-savvy students. Implementing iPad technology in the classroom will reignite students’ enthusiasm for learning, but the proper steps must be taken for full advantage of the iPads many benefits in education. Here are 5 tips to successful iPad implementation in the classroom. Obviously you need to begin by identifying the goal of your schools iPad implementation program. Clearly, every school strives to give their students the best education possible, and to accomplish this they need to provide their students with the best access to the most current educational information available. Organize a specified list of things your school wishes to accomplish by implementing this new classroom technology. This list of goals will also help you get any doubtful parents or teachers on board as well. The role of the iPad in the classroom is not to come take over your classroom, nor is it to replace your teaching. 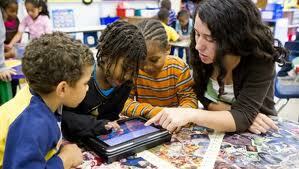 The iPad must be welcomed by teachers as a valuable learning tool. Educators need to understand that this device will give their students a better opportunity to share, connect, and seek out information. It will get students excited about learning and enhance their teaching. Using it should be seen as a privilege, not a right that way students will be persuaded to stay on task and use the device as a tool not a distraction. The teacher roll out should be well in advance to the full on student roll out. It’s important for educators to know the basic functionality of every learning tool they use. It may be scary for some teachers, but it’s as necessary as the adaptation from chalk to graphing calculators. Teachers must take the time to understand the iPad and learn how to take advantage of its many features. A great way to increase acceptance and help educators to get familiar with the device is to have training classes led by an expert. Have them show the basic functionality and give examples of ways it can be used in the classroom. Having educators that are well informed on the iPad and its features and functionality will make the implementation process run a lot smoother. The teachers need to be able to model appropriate use to the students. Remember the iPad is just a tool so there are times when it will need to put away. Teachers and students need to understand that it is just a learning tool and that some lessons are best taught without them. Some teacher may use them more than others, but forcing teachers to use them is not the answer. Allow your teachers to integrate them at their own pace. Certain subject and certain lessons may require their use more or less than other times. Administrators should follow up with teachers and ask them how they have integrated iPad use into their lessons to make sure the iPads aren’t taking over the teacher’s job and students aren’t getting too attached to them. The iPad is a way to give students access to a plethora of information, but it’s important for educators to show them how to filter and think critically about the information they are finding. Although many of today’s generation are tech-savvy they still may not know the efficient route to finding and filtering information. The iPad is an amazing tool but students need to be taught appropriate use, features, and functions as soon as the roll-out begins in order to take full advantage of its many benefits. iPad implementation might seem a little daunting, but it’s an inevitable step toward improving your technology in the classroom and your schools education overall. Here at SecurEgde we are experts in implementing classroom technology. We have worked with schools all over the US. If you have any questions or would like a free consultation just contact us here. Also check out our Free Guide to Preparing You Network for the iPad for more great information. Good luck!